Kali Mist is a feminized sativa Marijuana strain considered by many as the purest sativa strain existing on the market. Winner of 10 awards, high yielder. It is the ideal option for experts grown for their own consumption. Kali Mist is a feminized sativa Marijuana strain and considered by many as the purest sativa Marijuana existing on the market. Indeed, its genome is constituted by 90% of Sativa genes. Therefore, Kali Mist develops and grows with all the typical characteristis of a sativa Cannabis: high height, slimness and few leaves, but with great and surprising productions. Its light structure and the virtual absence of leabes enables light to reach to the lower branches thus obtaining an optimal development also in that part. 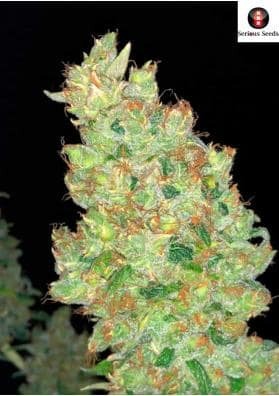 Kali Mist produces dense and compact buds that grow in spiral all along the branches and releasing a delicious spicy scent being totally covered by large amounts of resin. Nonetheless, this plant is quite resistant to mold, even when grown in cold and humid climates. In 2000, the productivity of Kali Mist was improved and is now capable to give between 300-500g per square meter indoors in 70-90 days, or in late November in the garden. Despite not being particularly fast it will produce a top quality weed that will definitely surprise you. In fact, Kali Mist has been awarded 10 times in several Marijuana cups and it is often the choice of experts growers for their own personal use. Besides that, some women state that its effect is mainly cerebral contributing, among other things, to soothe menstrual cramps. This strain has everyhing!